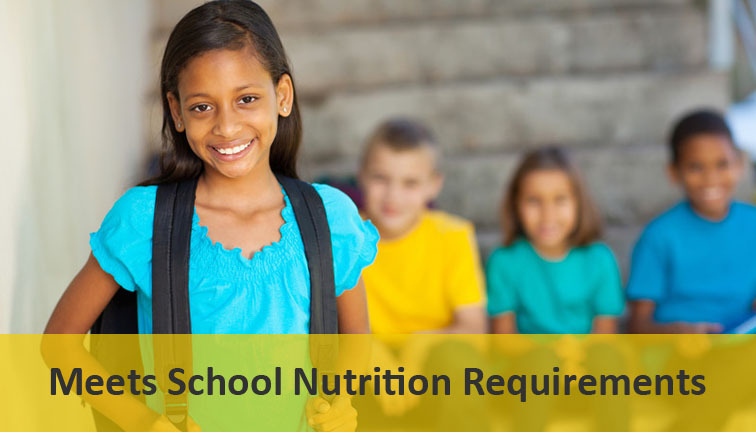 Rockin’ola Granola was specifically developed for schools to meet the USDA whole grain requirements for the Child Nutrition Program. We are continually innovating with new items such as Rockin’ola PRO, which credits as a Meat/Meat Alternate + 1oz EQ Grain, and Sun-Berry Trail Mix, which credits as a Meat/Meat Alternate + 1/2 cup Fruit. Rockin’ola Granola is made from 100% Whole Grain Oats and is Clean Label…Low/No Sodium, No artificial additives, No HFCS, No hydrogenated oils. Rockin’ola is Allergen-Friendly….NO Peanuts, Tree Nuts, Wheat, Dairy, Eggs, Soy* (except for PRO, which does contain soy). Awesome flavors include Chocolate and Strawberry (with and without marshmallows), Cinnamon, NEW Espresso Blast, and PRO Protein Granola. All granola flavors (except Pro) come in 1 or 2oz. EQ Grain Credit I/W pouches, or in a 3# Bulk Bag! PRO Protein Granola comes in a 1.5oz. pouch and credits as 1M/MA + 1oz EQ Grain. It also comes in a 3# Bulk Bag. New Sun-Berry Trail Mix credits as 1 M/MA + ½ cup Fruit. Vegan, Gluten Free, Clean label. GREAT on Salads. Comes in a 2.16oz. pouch. Rockin’ola Products Meet “Smart Snacks” rules….and kids LOVE it! Menu Rockin’ola in place of any 1 or 2 oz EQ grain product OR PRO for 1 M/MA + 1oz EQ Grain. Serve with yogurt for breakfast, lunch ( try Strawberry, PRO, or Sun-Berry Trail Mix on salad – super tasty!) or snack. Great for Grab-n-Go, after school or supper programs! Other serving suggestions: pair with applesauce, pour in a bowl with milk, oatmeal topper, or straight from the pouch.